Jet Ski Jon showing a group how to REALLY have a blast! Jet Ski Fort Lauderdale offers you the ultimate Fort Lauderdale Jet Ski Tours accompanied by an experienced jet ski guide. You can explore the fascinating waterways surrounding Florida’s Fort Lauderdale coast, made all the more memorable and enjoyable because your tour guide provides trivia, fun facts, information and more so you can relax and simply concentrate on the sightseeing. They personally guide you through 16 miles of waterways, pointing out interesting facts and tidbits of information about the historical structures, mega yachts and millionaire mansions you see along the way. They take photos of all riders participating in the tour so you can have tangible memories of your once-in-a-lifetime seagoing adventure. They are well trained and skilled at handling any emergency that might develop, providing crucial emergency assistance and arranging for tows when necessary so you can sit back, relax and savor the open water experience. They prevent riders from getting lost and incurring late fees for late jet ski returns. Fort Lauderdale Jet Ski Tours and Rentals – We have it all! Fort Lauderdale Jet Ski Tours are a perfect way for you and your family, or you and a group of friends, to get out onto the waters surrounding the Fort Lauderdale coastline, commonly known as the Venice of America. There is no better way to see Millionaire Mile, Boca Inlet and Port Everglades than from the unique perspective of being a participant in a Jet Ski Fort Lauderdale guided tour. 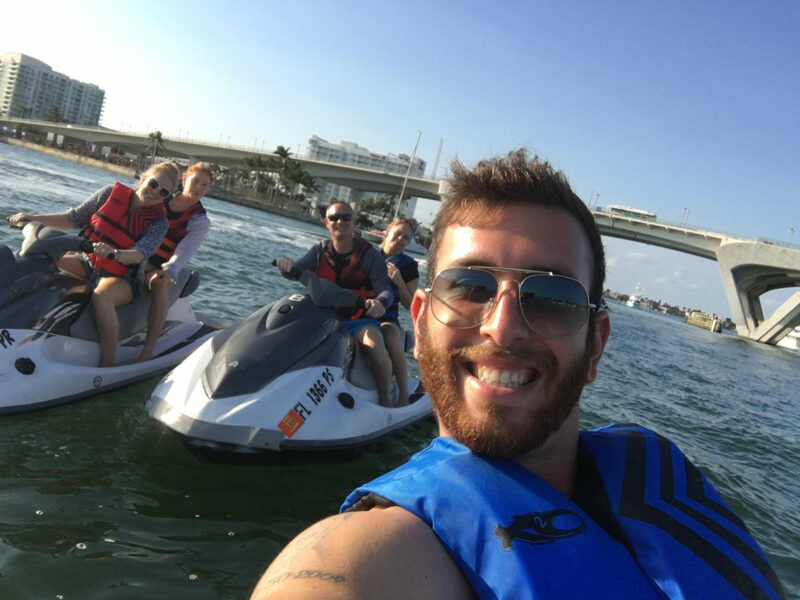 Jet Ski Tours Fort Lauderdale provides you and your family and friends with a 16 mile round-trip adventure that can be scheduled within either a one or two-hour timeframe. And scheduling Jet Ski Tours Fort Lauderdale rather than an individual rental is an exceptional value. It costs the same as regular rental prices, plus a 20% gratuity, but also includes all of the benefits that an experienced guide can offer you and your group. Previous Jet Ski Fort Lauderdale tour participants tell us that a jet ski tour is a not-to-be-missed Florida holiday experience. It’s fun, exhilarating, educational, interesting and best of all, a very safe way to sightsee! You not only experience the adventure of seeing Florida’s coastal sights while riding a powerful state of the art jet ski that’s on both intracoastal and ocean waters, you won’t miss a thing, thanks to the help and assistance provided by your group’s personal guide. Reserve your Jet Ski guided tour today by calling 954-383-8724.